Trying to live an integrated life, my husband and I try to be pro-life in every way we can. This includes refusing to patronize companies that give money to Planned Parenthood and other abortion, contraception, or embryonic stem cell research industries. Getting an accurate list of such companies can be difficult, but the people at "Fight Planned Parenthood" do a pretty good job. A partial list of such companies can be found on their front page. It's cut back on a lot of our favorites. Chase Bank, Ben & Jerry's, Whole Foods Markets? Ouch. But by far the one that hurts the most is the Girl Scouts. NO GIRL SCOUT COOKIES!? No, I'm sorry, but as a personal decision I can't buy a $4 box of Samoas with a clear conscience. 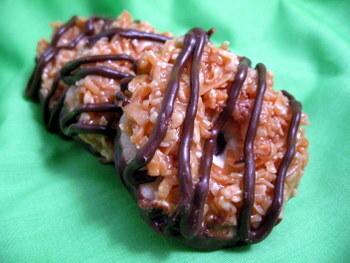 But Samoas are right up there with beef jerky as my favorite food! Thankfully, the world of blogging has reintroduced the Caramel De-Lites back into my life. The genius, Nicole, at Baking Bites has recreated them. Yes, it's labor intensive (though she has a simple Samoa Bars recipe), but if you have some time to spare this summer, why not give 'em a try? How do they compare? I'll let you know when the sugar coma wears off. In a large mixing bowl, cream together butter and sugar. Mix in flour, baking powder and salt at a low speed, followed by the vanilla and milk, adding in the milk as needed to make the dough come together without being sticky (it’s possible you might not need to add milk at all). The dough should come together into a soft, not-too-sticky ball. Add in a bit of extra flour if your dough is very sticky. Roll the dough (working in two or three batches) out between pieces of wax paper to about 1/4-inch thickness (or slightly less) and use a 1 1/2-inch cookie cutter to make rounds. Place on a parchment lined baking sheet and use a knife, or the end of a wide straw, to cut a smaller center hole. Repeat with remaining dough. Alternatively, use scant tablespoons of dough and press into an even layer in a mini donut pan to form the rounds. Bake cookies for 10-12 minutes, until bottoms are lightly browned and cookies are set. If using a mini donut pan, bake for only about 10 minutes, until edges are light gold. Cool for a few minutes on the baking sheet then transfer to a wire rack to cool completely. Preheat oven to 300. Spread coconut evenly on a parchment-lined baking sheet (preferably one with sides) and toast 20 minutes, stirring every 5 minutes, until coconut is golden. Cool on baking sheet, stirring occasionally. Set aside. Unwrap the caramels and place in a large microwave-safe bowl with milk and salt. Cook on high for 3-4 minutes, stopping to stir a few times to help the caramel melt. When smooth, fold in toasted coconut with a spatula. Using the spatula or a small offset spatula, spread topping on cooled cookies, using about 2-3 tsp per cookie. Reheat caramel for a few seconds in the microwave if it gets too firm to work with. While topping sets up, melt chocolate in a small bowl. Heat on high in the microwave in 45 second intervals, stirring thoroughly to prevent scorching. Dip the base of each cookie into the chocolate and place on a clean piece of parchment paper. Transfer all remaining chocolate (or melt a bit of additional chocolate, if necessary) into a piping bag or a ziplock bag with the corner snipped off and drizzle finished cookies with chocolate. Let chocolate set completely before storing in an airtight container. Makes about 3 1/2-4 dozen cookies. Wow. You've totally made my day. We still buy Girl Scout cookies (mostly to support my friend's daughter) but when we run out of Samoas it's always a sad day for me. OH MY!! These are my husbands favorite cookies on the planet. I had no idea there was a recipe. Yippee!! Can't wait to try it out! God Bless you!!! Those look YUMMY!!!! I've made these before, and they.are.fantastic! Lots of work, but well worth it!! Enjoy! !